Remember this guy? That’s Gary Pescatore of Central Mass Powersports, in Lunenburg, MA. They sell and service just about every type of motorcycle, personal watercraft, snowmobile and trailer, along with safety gear for riders of all ages. If it has an engine and it’s fun you’ll find it at CMP. A couple years back that included a brief interlude with karts, and he was an enthusiastic sponsor. 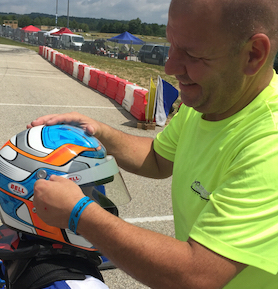 While no longer in the sport, he remains a great resource for kart racers when it comes to helmets. Not only does CMP stock a tremendous array across multiple brands, but Gary himself is an invaluable resource given his years of experience in the helmet business. So I thanked my lucky stars that I hadn’t taken any more shots to the head, and I thanked my helmet for saving me from a life of slurping applesauce through a straw, then I tossed it into the trash. And just like that I went from helmet reporter to helmet shopper. Here’s a line I know you’ve heard immediately before having a helmet that’s five times your stated budget jammed down your throat: “Do you have a bargain brain? Then why buy a bargain helmet?” I ask Gary his opinion on this cliché. “We sell helmets at every price point, and they’ll all offer protection for the applications they’re certified. That’s not to say there aren’t significant differences in quality of materials, features and build. The most common shell materials are plastic, fiberglass and carbon fiber. Obviously, carbon is the lightest and strongest, they’re fantastic. Fiberglass is next best with similar qualities at an excellent value for the driver on a budget.” Or if they’re cheap, like some people. “Each helmet manufacture has their own sizing charts,” advises Gary. “So you’ll need to compare your measurements to each brand’s sizing.” He says the best way to measure your head is with a soft measuring tape, like tailors use, or use a piece of string and measure that. Wrap the type or string around your head about a half-inch above your eyebrows, above your ears and around the back of your head at the largest point. Do it a few times to make sure you’ve measured the largest circumference. Having someone do the measuring for you will yield the most accurate result. “Beware, measurements aren’t everything,” warns Gary, “head shape is just as important. Take two drivers with the exact same measurements and give them a perfectly sized helmet. On one it’ll be a perfectly snug fit, but on the other it’ll be too loose or too tight in spots. That’s because everybody’s head is shaped differently, and each manufacturer’s biomorphic mold is different.” This I can personally attest to. I feel like half my face hangs out the bottom of the best fitting Bell or Arai. The closest Shoei still feels wrong. But HJCs consistently feel just right. 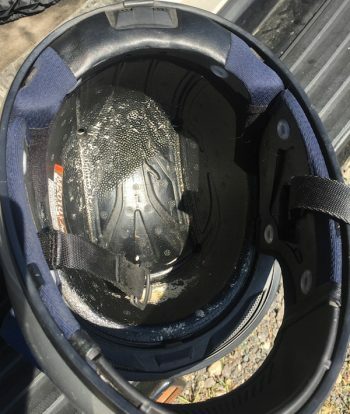 “A correctly-sized helmet that doesn’t fit is not only cumbersome,” says Gary, “it does not offer the same protection. The importance of fit can’t be overstated. You absolutely must try on a variety of helmets to know what’s right for you. A few days later I met up with Gary who had pulled several helmets that matched my measurements from different manufacturers. Sure enough, the fiberglass HJC was the one for me. 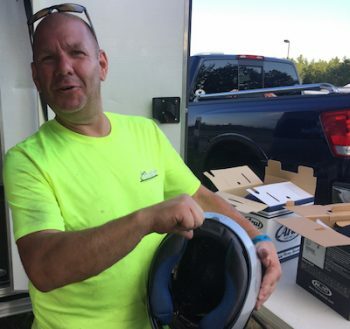 I miss seeing Gary and the kids at the track, but it’s good to know he’s still around to fill our racers’ heads with knowledge, and protect those heads with the right helmet.